Georgia based Anthony David, best known for his Grammy nominated hit Words, merges Southern flavor with new school grooves for an exciting soul sound. Savannah born, David moved to Atlanta to pursue his music career after a short stint in the military. 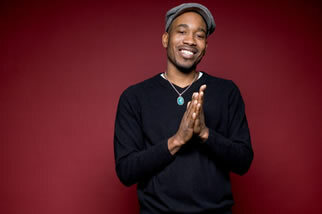 In Atlanta, he befriended India Arie over their mutual love of 60s soul and David composed a song for Aries Acoustic Soul in 2002. He released his first independent album, Three Chords & The Truth in 2004 and followed up with The Red Clay Chronicles and an international tour. Davids Words won the 2007 SoulTracks Readers’ Choice Award for Song of the Year.